There’s an endless list of hair products out there to buy. Some are awesome, others may not be worth the investment. Life, however, can be far simpler than endless expensive trips to the beauty supply store. 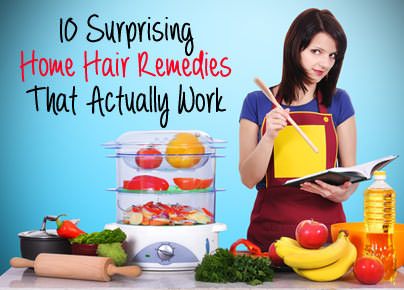 In fact, there are some great hair products waiting right in your kitchen! We’ve rounded up a list of the top kitchen hair hacks out there for you beauties. Take a peep at these surprising home hair remedies that actually work! “I’ve been known to use the old guacamole-follicle trick when on vacation. Who can be bothered to actually pack a deep conditioner? Not me. I just mash up about 1/4 fresh avocado, rub it between my palms, and spread it through my hair before tying it back. Then I just let the sun go to work on warming it up to help infuse all the natural oils into my strands. Since avocado oil is relatively light to begin with, it’s easy to rinse out with a good clarifying shampoo after and super easy to do,” says Bryce Gruber of The Luxury Spot. Avocados contain vitamins A,D, E and B6 as well as magnesium, folic acid, amino acids, copper and iron, all of which can help with both hair growth and nourishment. Coconut oil is a wonderful “pre-washing” moisturizing treatment. For a great conditioner for dry, frazzled ends, use coconut oil! Simply apply it lightly with your fingers and comb through. Place a dab on your hands, rub together and moisturize your ends with it. You can also use a dispensing product like a Misto to spritz and disperse it all over for added moisture and shine, just don’t forget to rinse it out! Obviously, we’re using water in our shower to wash ourselves and our tresses, but for our final hair rinse, celebrity stylist Matt Fugate of Sally Hershberger suggests keeping bottled water chilled and ready in your fridge. “Beer works surprisingly well as a shine and volume-enhancer,” says Jamie Stone of HonestlyJamie.com. “The hops and yeast in the beer actually plump your hair follicles and, most of the time, my hair also ends up super shiny and soft as a bonus,” says Stone. You want to use a dark beer and apply it to wet hair after you shampoo and condition. Rinse out with cool water after distributing the beer throughout with your fingers. “Try an at-home salt spray! I use sea salt and put it in a spray bottle with water and a smidge of olive oil. Spray it on second-day hair for healthy, at home beachy waves,” says Amber Katz of Rouge18.com. “To get rid of product build up and to clarify your strands, dilute apple cider vinegar in warm water and use it as a rinse at the end of your shampoo,” says Wendy Lewis of Beautyinthebag.com. Did you know that baking soda mixed in shampoo will remove some of the dye molecules from the surface of the hair? Crazy! “Tomato juice helps reduce green and ash hues from hair,” says Daniel Gravel of DG SALON in Huntington Beach, California. “Heavy cream is great to put much needed protein (and plumpness) back into your hair before styling it with texture,” says Gravel.